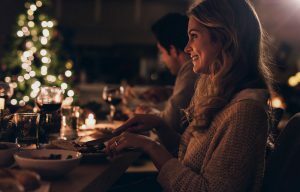 Christmas and New Year is a time for family and friends to gather for the holidays, have fun, eat good food and reconnect. Whether you actually celebrate Christmas or not, villa Kalyana is the perfect place to organise all your family and friends to come together. Although Christmas isn’t a Buddhist festival and the Thai New Year is in April, it doesn’t stop the Thai people celebrating and joining in the Christmas cheer. Don’t be surprised to see sparkling Christmas trees, tinsel and happy Santa adorning the shops and streets in Koh Samui. 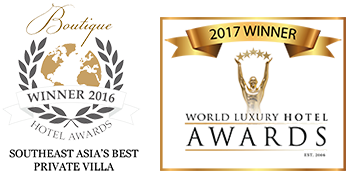 At villa Kalyana we can do our best to arrange a ‘traditional’ tropical Christmas, or if you are here to escape the festivities, then it’s the perfect place to do that too. Either way, it’ll be warm! 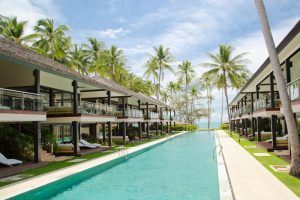 We’ve put together a few recommendations in and outside villa Kalyana for a bit of a Christmas cheer. Yes, we do have Christmas trees at Kalyana so, if you let us know in advance, we can arrange to have the trees ready for your arrival for the presents to be put underneath. 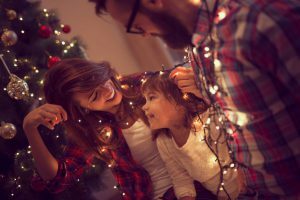 We can decorate the tree in advance, or if there are children in your party and depending when you arrive, then the excitement of decorating the tree can all be theirs. We can arrange a simple Santa suit, so if you have a willing member in your party, you can surprise the kids with Santa arriving on the beach to deliver their presents. Whether you are doing your Christmas shopping or just want to treat yourself, Koh Samui is a haven for shoppers. 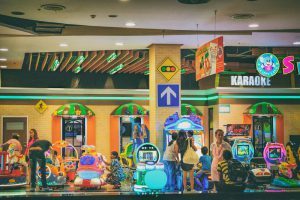 Central Festival shopping mall is a good place to start with a myriad of boutiques, stalls, cafes and a kid’s play area in the middle of Chaweng. During the festive season, the shops are artfully decorated and there’s a huge, exquisitely decorated Christmas tree. 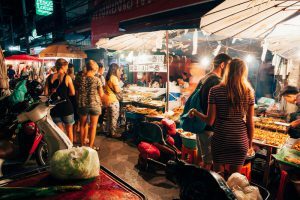 They stage events too, like dancing and talent competitions and on a Sunday there’s a Thai Dancing Carnival, on Saturday an Art Market, and a Walking Street market every Wednesday. There’s bound to be some Christmas festivities going on too. Walking street markets have lots of stalls to treat yourself, or find some special presents for your friends and family. Be sure to stock up on your Santa hats and reindeer pool inflatables! 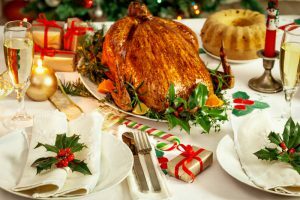 If your preferred Christmas dinner is turkey, roast potatoes with all the trimmings then, with advance notice, we can cook up a Christmas feast fit for Santa! Alternatively, how about a BBQ on the beach? You can choose from seafood, meat BBQ or how about a hog roast? Have all the family, gather on the lawn by the beach with those irresistible BBQ smells! As the sun goes down, how about a mince pie and mulled wine. With the twinkling fairy lights around the garden and your toes in the sand enjoying a Christmas dinner, it will certainly be a day to remember! Christmas wouldn’t be Christmas without the ubiquitous Christmas songs. Gather your group together around the tree for a sing song. Pass round the mince pies and sup on mulled wine before handing out the presents and watching the faces of the little ones light up. There are a couple of churches in Koh Samui which have carol singing and Christmas services. St Anne’s church in Nathon is warm and welcoming and it’s only a short car journey away. Once you’ve eaten and drunk, then a fitting end to Christmas day is a pool party. Done the Santa hats, blow up the reindeer pool inflatables, enjoy your favourite drinks or three and party the night away. 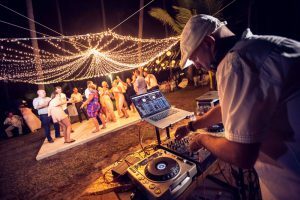 A live band or DJ can be arranged and to make it extra special or fire dance display or Thai dance could add that magical touch. The children can snuggle in the TV room with a Christmas movie, before bed allowing time for adult time celebrations. If you booked your trip looking to simply switch off from Christmas and get away from it all, then there’s plenty of things to do. 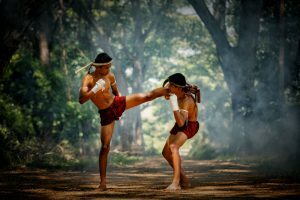 Culture day trips around the island taking in the sights, indulge in regular yoga or Muay Thai boxing sessions or the adrenaline seekers in the group may wish to zip wire through the jungle or join a local cooking class. 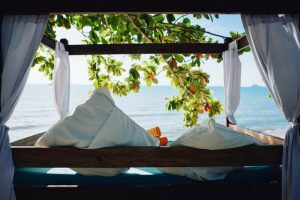 If you’d really prefer to read a book and enjoy some tranquillity or the chic beach bars on one of the many stunning beaches may be more your thing. If you’re really not keen, or simply do not celebrate Christmas, we would be more than happy to indulge you with fabulous Thai food and a true pampering to make it a great get away from it all holiday. New Year’s Eve is another special time to spend with family and friends. 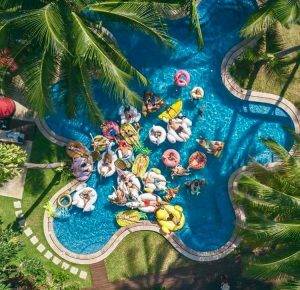 A Kalyana pool party with entertainment and fireworks is a great way to see in the New Year. You don’t need to go anywhere or get back afterwards, you can dress up or hang out in your beach gear and you can be happy in the knowledge the kids are close by when it gets to their bedtime. If a beach BBQ, a live band or DJ and dancing around the pool sounds good, then let us know in advance and we can make arrangements. At the stroke of midnight, enjoy your own private firework display beach side watching the night sky light up as you ring in the New Year. 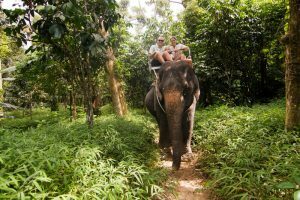 If you want to venture out, Koh Samui offers a range of New Year’s Eve activities to keep you busy. Noisy countdowns, awesome pyrotechnics shows and jolly New Year revellers come together on most beaches. Remember the bigger the beach, the bigger the show!! 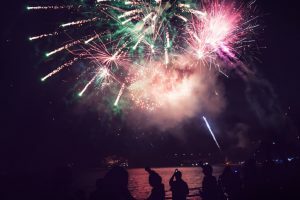 Chaweng and Lamai obviously make the biggest bangs, but maybe you’d like to view the fireworks from a restaurant or bar in Bophut, Maenam and Choeng Mon beaches, which will be fun and less hectic for families. Nikki Beach just along the coast from villa Kalyana at Lipa Noi, known as one of the sexiest beach bars, rings in the New Year with world-class entertainment, live musicians and dancers, excellent resident DJs, Nikki Beach Signature Style surprises, and a spectacular fireworks display! 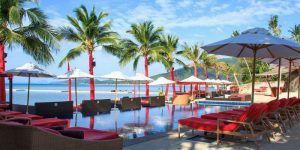 Beach Republic in Lamai is a popular beach club for tourists and expats alike with its friendly, cool vibe and beachfront location. International DJs spin the tunes and poolside becomes a dance floor well into the early hours. Expect an impressive firework display and some surprise live entertainment throughout the night. See https://beachrepublic.com/events/index.html for more information. 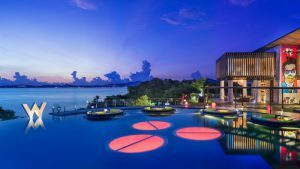 Woobar at the W hotel on Maenam beach is an iconic beach side bar with circular lily like floating pads decked out with sofas for the ultimate New Year indulgence. On New Year’s Eve, the entertainment includes fire dancers and fireworks and a DJ set fit for welcoming in 2018.